The start of a 2.7km hike. This morning we went to Johnston Canyon after checking out of our hotel. Nobody was around when we arrived at the canyon, the only footprints in the snow belonged to animals. It looks way colder than it actually was. There wasn’t any wind, so it was quite “warm”. By “warm”, I mean, it was -1 Degree Celcius. It was snowing lightly, the forest was silent and peaceful aside from the occasional squirrel chatter. Since it’s winter, the rivers and waterfalls are slowly starting to freeze over. And the water is such a pretty shade of blue-green. 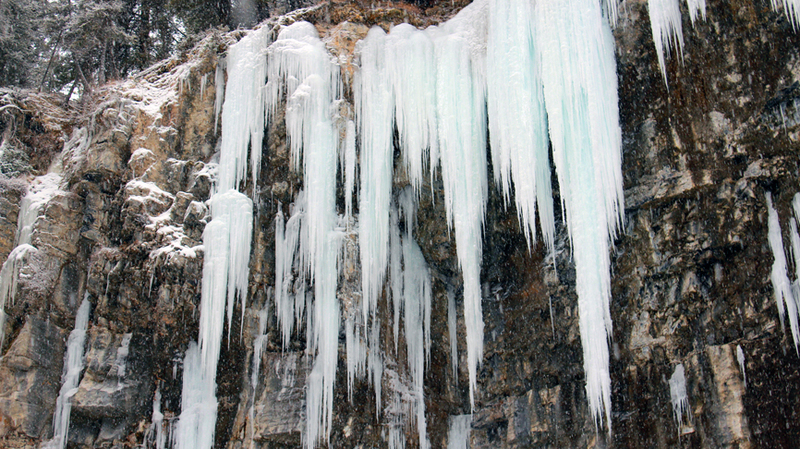 And near the end of the trail, icicles decorated the sides of the mountains. It was worth the hike. In total, I think the hike took about 2.5 hours. We stopped a lot to take pictures though, so maybe that’s why. And with this, we have finished our Banff travels. I wonder what the next destination will bring us? I’m looking forward to it. Make sure you are following us on Twitter for more updates! You can check the #RealCanada hashtag too! Posted in Canada, Tourism, TravelTagged #RealCanada, 2011, Alberta, カナダ, Banff, Canadian Tourism Commission, ciaela, CTC, 英語, 観光, JetDaisuke, Johnston Canyon, Micaela, Real Canada, travel, youtube, 局, 旅行, 日本語Bookmark the permalink. The place looks terrific! It’s cool that you succeeded to mix English and Japanese. It makes your posts so beautiful! Hopefully next time when you’re in Calgary, we can get together. Thank you for beautiful photo & polite captions , I appreciate your kindness , because we could feel and recognize fantastic Canadian natures! Love Johnston’s Canyon…thanks for the pics as I have never seen it in winter. My relatives actually own it…they have had it since as long as I can remember and I am 52! Good Job Micaela, enjoyed the tour!! In the summer if you have more time the Ink Pots are amazing, but take a little more time !